So, last week, Van Jackson made us mad. As It Turns Out, Jackson, a highly astute Asia Hand who has rightly made it his mission to articulate the US's history of mishandling North Korea policy in blunt terms, is not alone. 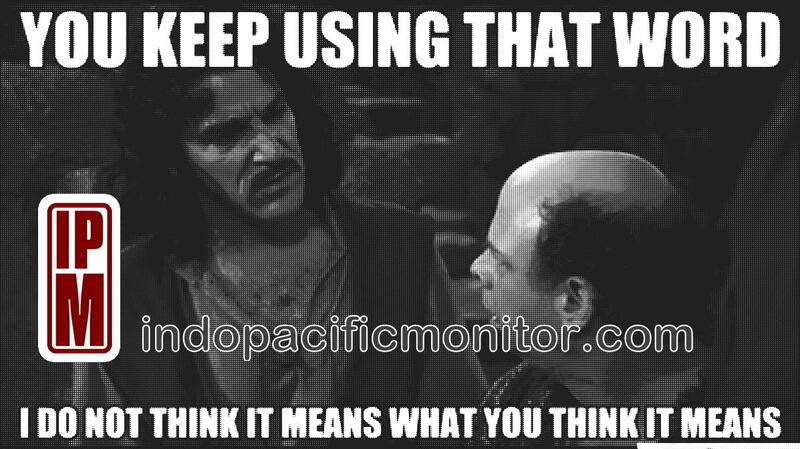 The Trump administration's possible overuse of the term "Indo-Pacific" has generated backlash from leadership in China and South Korea as well. The US administration Keeps Using That Term, but the real question is do other players in the theater Think It Means what the US administration Thinks It Means. Some accuse US policy of cravenly adopting the term in order to sublimate the role of China in the region, or on bringing India into the picture towards that end. Or it could simply be that Donald Trump, given his flopsweat performance in recent Asia summitry, has given his reverse Midas touch to the term. In any case, not even Gurpreet Khurana, the first strategist who coined the term's modern geopolitical use, agrees with how the US is using it. As you can imagine, we find this all rather disturbing (see masthead, above). "Indo-Pacific" has been used in biogeography since the 1970's, because together, the South Pacific and Indian Oceans for all practical purposes represent a vast, common domain of similar marine life. As fish migrate, so do humans. Historically, these two oceans and their constituent lands also have a history of shared human cultural heritages. Chief among these are the spread of Buddhism and Asian Islam. Ethnic diasporas, such as from India, China, Japan, the Philippines, and the Pacific Islands, the result of migration driven by imperial fortune-hunting, or to work for better pay and send the money home, or even to escape from sea level rise, are also a permanent feature of the region. These are threads which permeate South, Southeast (it wasn't for nothing that mainland Southeast Asia used be be called "Indochina"), and East Asia. The Indo-Pacific, as the nexus of the Indian and Western Pacific oceans, is where important things have always happened and will continue to happen at an increasing rate. The convergences are real - and Indo-Pacific Consciousness is about leveraging that convergence for engagement, not a false posturing of confrontation. Rather than a sublimation of China, the emergence of Indo-Pacific Consciousness in international affairs is a reflection of China's reassertion of influence over her western periphery, such as with the Belt and Road Initiative (BRI). But it's also a reflection of the economic awakening of South Asia, and of Australia coming out of her shell as a regional power, albeit with much kicking, screaming, and gnashing of teeth. If American policy continues in the direction of transactional (and likely toothless) confrontation, it will reflect that as well. It also reflects a hub of increasing connectivity generally, reaching out to Africa in one direction and America in the other. Is the ongoing chain of North Korea crises an issue for the Indo-Pacific? To the extent that the DPRK uses the center of that region to evade sanctions and act out internal power plays, the answer is yes. South Korea may not see those connections, but Japan certainly does. Is the Rohingya crisis an issue for Asean? Absolutely, and how they tackle it will define the future viability of that alliance. So yes, Indo-Pacific Consciousness is A Thing. But it's also become clear that the US is Doing it Wrong.